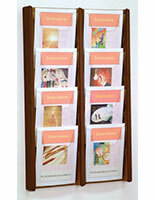 This 6 pocket literature display features an adjustable peg for trifold documents. 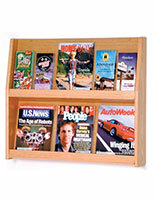 This acrylic and wood fixture will hold a newspaper collection, but can be adjusted to accommodate trifold pamphlets. 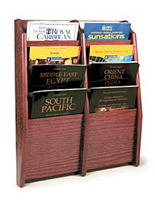 This 6 pocket literature display that is a paper sorter is among our most popular holders for its looks and function! 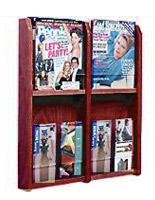 This business accessory is hung on a wall, leaving floor and counter open for traffic. 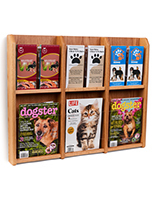 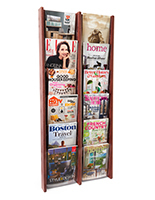 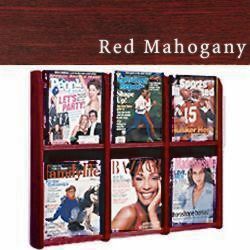 This 6 pocket literature display, magazine rack, has a beautiful wood grain finish in red mahogany, making it look expensive - but it is very affordable at this website!